Unfortunately the Bishops name is not on the flan on this specimen. The obverse type is more typical of issues of Gerhard V der Mark, but the reverse type is more typical of coins issued by Wilhem von Holte. It might be possible to determine which issued this coin, but so far I have not been able to do so (I lack the major references on this series). Denomination : Silver pfenning. Mint : Munster. Date : some time between 1259 and 1292. Size : 13.0 x 13.6 mm. Weight : 1.46 grams. Reference : Bon 1656 or 1657. 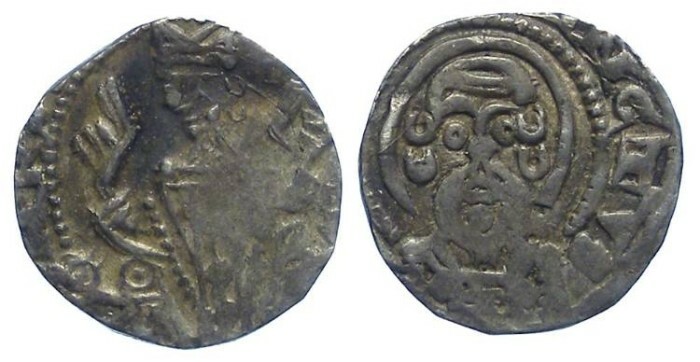 Obverse : Bishop seated with head left, with two fragmenary letters to the left. Reverse : Saint Paul looking forward, with the partial inscriptions ANCTVS to the right.